Flunk består av Anja Øyen Vister på vokal, Jo Bakke på gitar, og Ulf Nygaard på elektronikk. "This Is What You Get" er deres fjerde ordinære album (i tillegg til to remix-album, og ett mini-/remix-album). Hvor "For Sleepyheads Only" fra 2002 var preget av post-trip-hop beats, og "Morning Star" fra 2004 var mer rendyrket pop med både folk og country-elementer, fortsetter "This Is What You Get" linja fra forrige album "Personal Stereo" fra 2007, med dystrere og mer eksperimentelle undertoner, og mer framtredende elektroniske elementer. Denne gangen med tydelig inspirasjon fra Londons bakgater, med dubstep-elementer (Stain, Shoreline og delvis åpningssporet Dying To See You), og house-elementer (Common Sense), og litt smådrypp av mer rocka ting (Ride). Fortsatt er pop-elementene tilstede, som som i Cigarette Burns,Common Sense, og Down. Flunk har for vane å inkludere en coverlåt på hvert album, og denne gangen har turen kommet til Radiohead-klassikeren Karma Police, med røffe, edgy synkoperte rytmer og Anja’s særegne vokal. Flunk consists of Anja Øyen Vister on vocals, Jo Bakke on gitar, and Ulf Nygaard on electronics. They have many fanbases around the world, not least among film- and TV-producers in the US. 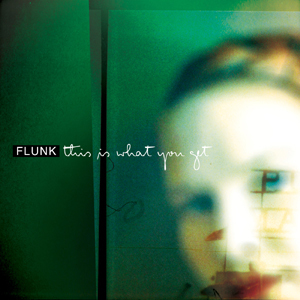 (The O.C., C.S.I., The L Word, amongst others) The first two albums have sold over 10,000 copies each in the US, and Flunk is one of the Norwegian bands with most contributions on compilations around the world. Their debut single and their cover of New Order’s 80s classic ”Blue Monday” coined the term ”folktronica”. ”This Is What You Get” is their fourth regular album (in addition to two remix-albums, and one combined mini-/remix-album). Where "For Sleepyheads Only" from 2002 was influenced by (post) trip-hop beats, and "Morning Star" from 2004 was more of a pure pop album with folk and country elements, "This Is What You Get" is a natural evolution from their last album "Personal Stereo" (2007), with a darker and more experimental feel, with the electronic elements more present in the sound. This time with a distinct inspiration from the backstreets of London, with dubstep-elements (Stain, Shoreline, and partly in Dying To See You), and house-elements (Common Sense), but also a small dose of rock (Ride). The pop elements are still there, for example in Cigarette Burns,Common Sense and Down. Flunk have the habit of including a cover track on each album, this time the Radiohead-classic Karma Police gets the Flunk treatement, with rough, edgy syncopated rhythms and Anja’s lovely vocals.